Consumers enjoy the cheaper taxi services provided by Uber, but the company has proven divisive among taxi drivers. Regulators should allow Uber to operate, but under stricter regulations, to ensure that consumers reap the benefits, and drivers operate on a level playing field. The ‘sharing economy’ matches people who want to share assets online. Rather than buying a power drill that I only need for 15 minutes, for example, I can just rent one from someone else who’s not using theirs. Such efficiency gains may come at cost for the traditional economy. Manufacturers of power drills might see profits shrink due to the drop in demand and may even be driven out of the market. However the costs and benefits associated with sharing economy platforms depend on the business models in place. Uber is one of the fastest growing startups worldwide, but its rise has led to massive demonstrations by taxi drivers. Courts have banned or restricted Uber’s services for engaging in unfair competition with regular taxis. While other ridesharing online platforms like Lyft and Sidecar use similar business models, Uber is at the centre of the debate due to its size and rapid growth worldwide. 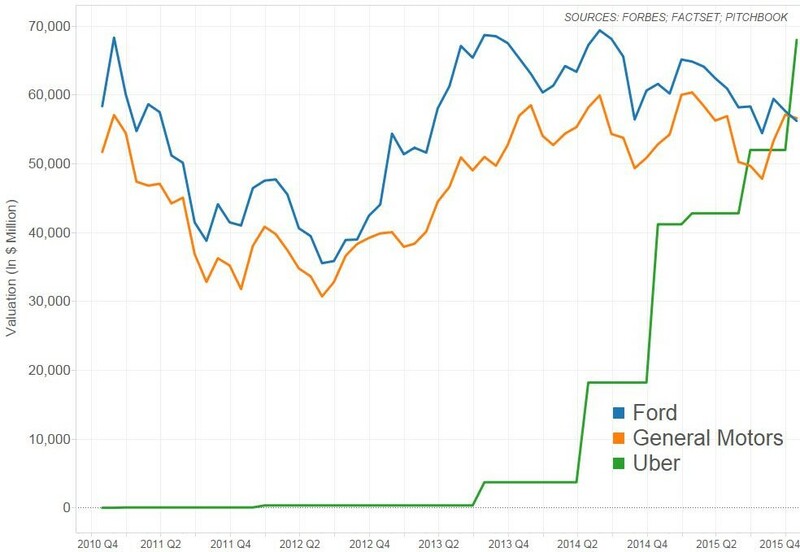 In December Uber was valued at $68 billion, having taken just 6 years to surpass the valuation of 100-year-old companies like General Motors and Ford, as well as “traditional” transportation companies like Hertz and Avis. Uber connects drivers offering rides and passengers seeking them online. Potential passengers download an app that allows them to request the nearest available Uber car on their smartphone. The company does not own cars, but signs up private drivers willing to provide rides to paying passengers and passes the ride requests directly to them. Uber sets the price of the ride, and transactions happen through the online platform. 70-80% of each fare goes to the driver and the rest is kept by Uber. Uber’s online platform is user-friendly, and its rates are generally lower than regular taxis. Uber is cheaper in most major American cities, even excluding the taxi driver’s tip, as shown in Table 1 and 2. Side note: Silverstein, 2014, calculates the fares for a sample trip of 5 miles in 10 minutes under car speed of 30MPH with no waiting time. 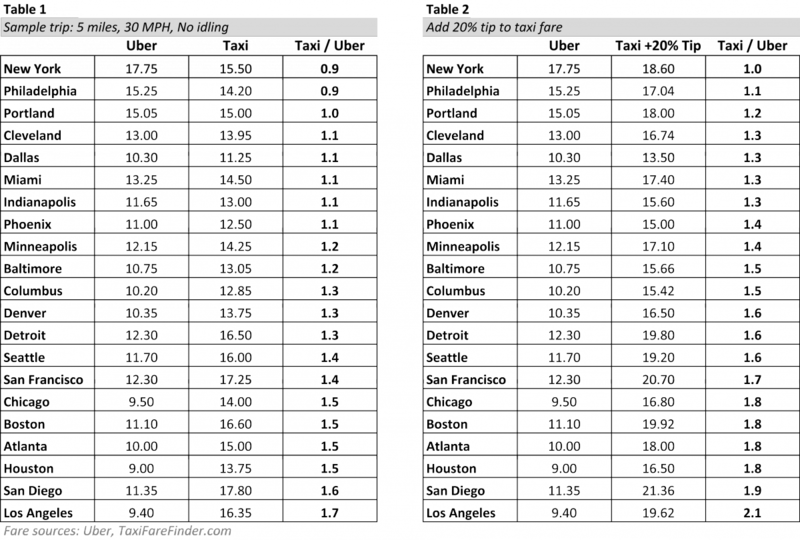 Tables 1 and 2 refer to baseline estimates, without “surge pricing”. Uber’s pricing model is dynamic, changing the price to equalize supply with demand. If there is high demand for rides and few drivers on the road (common at weekends or on national holidays), the price increases. This motivates more drivers to work, and reduces the number of passengers, as some prefer other modes of transportation (for example regular taxis) if the price is high. The app informs customers when “surge pricing” takes place, and the price of the increased fare, so there is no asymmetric information. However the Uber pricing algorithm has raised antitrust concerns regarding whether it facilitates implicit collusion among drivers. Critics point out that when competitors (drivers) agree on a pricing structure rather than competing against each other, this may qualify as price fixing. Moreover, in many cities, Uber’s pricing depends on the speed of the ride. Regular taxis charge riders per mile when moving, and per minute when idling. Uber charges riders per mile and minute whether they’re moving or idling. So, Uber prices drop as speed increases, since it is charging simultaneously for the miles and the driving time. As a result, taxis may become a more attractive option during times of traffic (provided that they are available and can be reached). In comparison to regular taxis, Uber has several advantages beyond lower fares. Instead of waiting in the street or calling a taxi service, passengers can request a car through Uber’s online platform and watch the car’s progress towards their location. In addition, transactions are performed electronically (with the exception of India where passengers can pay in cash if they wish) and so passengers can travel without cash or cards. Users can check the profile of the driver before selecting them and give their own opinion rating after the ride. This makes them feel safer than entering the car of a completely unknown driver. If the average rating of a driver is low, then they are dismissed by Uber. Uber’s success has been detrimental to the traditional taxi industry. Taxis are heavily regulated: rates are fixed and taxis must buy licences to operate. Such licenses are issued rarely, and become more valuable as the urban population grows. In big US cities the price (before Uber’s operation) varied between $350,000 and $1,000,000, while in Paris licences cost around 240,000 euros. Uber’s success has been detrimental to the traditional taxi industry. However Uber has severely reduced the value of licenses, as Uber drivers do not need licenses to enter the market. Licenses no longer grant protection from competition. Taxi drivers are no longer able to sell off their licenses as expected, and they are not financially protected against such sudden devaluations. In this way Uber’s entry has made things much more difficult for taxi drivers. In New York for example, the price of individual licenses dropped from $1 million in 2013 to $700,000-$800,000 in 2015, while in Chicago, they decreased by 33.3%. The asymmetry over the regulatory requirements (buy a taxi license vs. become an Uber driver for free) to enter the business creates unfair competition between the two. Restrictions on the number of available taxi licenses vary across the world. In New York there are 13.5 taxis (including private hire vehicles) for every 1000 inhabitants, while in London there are 10.8, in Stockholm 7.8 and in Paris only 3.4. The number of issued licenses may be affected by strong taxi lobbies that target high entry barriers, as in Paris and Brussels. Uber’s entry into the market has gradually reduced demand for traditional taxis. The number of trips by taxis in New York fell by 8% between 2012 and 2014 (Wallsten, 2015). 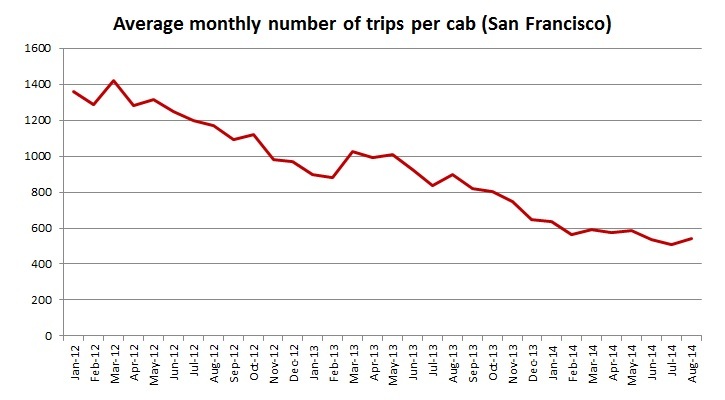 The trend was even more acute in San Francisco, where use of taxis declined by 65% in the two years after Uber’s entry. However, the reported number of complaints per taxi ride in New York decreased after the Uber’s entry into the market (Wallsten, 2015), suggesting that taxis unable to respond to Uber’s entry by reducing their regulated prices responded by improving their services. The reported number of complaints per taxi ride in New York decreased after the Uber’s entry into the market. 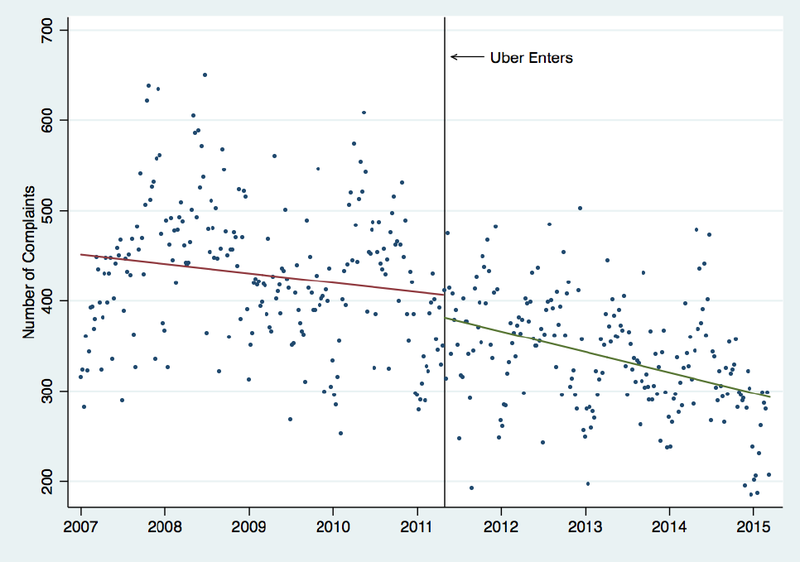 We should note, however, that due to data restrictions, Wallsten is unable to quantify the magnitude of this quality effect of Uber on taxi services. Experience shows that in some cases, taxi unions reacted by modernizing their fleet and launching online apps to reduce search costs for passengers. The number of Uber drivers has increased exponentially in recent years, as individuals have found Uber a flexible way to top up their income. 61% of Uber drivers in Boston, Chicago, Washington, Los Angeles, New York and San Francisco have another job (Hall and Krueger, 2015). Source: Hall and Krueger (2015), “An Analysis of the Labor Market for Uber’s Driver-Partners in the United States”. Working Papers (attached). However, Uber drivers are considered independent contractors, so they are not entitled to the minimum wage, paid vacations or health insurance. 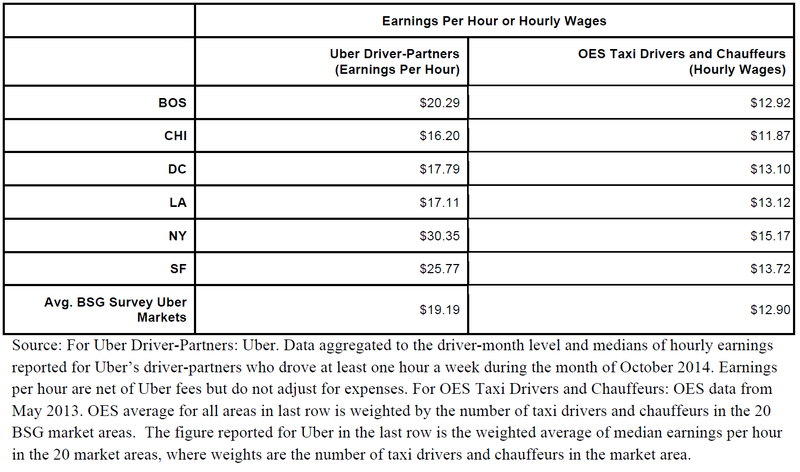 Earnings per hour for Uber drivers are higher than the hourly wages of taxi drivers and chauffeurs in Boston, Chicago, Washington, Los Angeles, New York and San Francisco (Hall and Krueger, 2015),but estimated earnings for Uber drivers do not account for costs incurred during the trip but only for Uber fees. A study by NerdWallet in the same cities estimates that Uber drivers would receive health care benefits worth an average of $5,500 a year, plus thousands more in mileage reimbursement, if the company provided them with the same benefits as its full-time employees. In addition, there have been multiple reported cases of violence of passengers against drivers, who due to their employment status are not eligible to work protection. Two US courts (in California and Florida) have recently ruled individual Uber drivers are regular employees, and ordered Uber to reimburse them for mileage or pay unemployment benefits. Uber drivers in the UK have filed claims seeking to change their status to employees rather than self-employed contractors. Taxi companies in Europe have gone to court, arguing that Uber does not comply with taxi regulations and therefore engages in unfair competition. Uber is now banned or subject to serious restrictions in Belgium, France, Germany, Italy and Spain. Such decisions have intensified the debate around Uber. Former European Commissioner Neelie Kroes even characterized the court decision to ban Uber from Brussels as “crazy” and in favor of a taxi cartel. Regulatory bodies around Europe were not ready for platforms like Uber. Regulators failed to react to the emergence of ride sharing online platforms and revise their price cap restrictions for taxis. Strong taxi lobbies have also made the authorities’ work more difficult. Regulatory bodies around Europe were not ready for platforms like Uber. The solution to all this is not to ban Uber, but to regulate it. The unfair competition is the result of the regulatory asymmetry between taxis and online ridesharing companies. 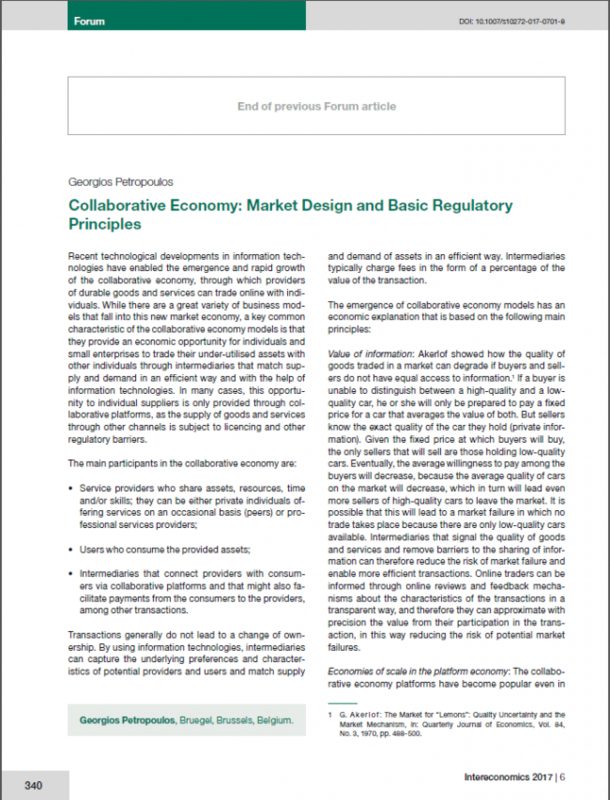 Regulators must to establish a framework that enhances the benefits and eliminates the associated costs and risks. One approach would be to balance passengers’ benefits and the incurred damages by taxi drivers. But such an approach would ignore the dynamic aspects of the competitive game. The presence of Uber might force the taxi industry to innovate and adopt new technologies to improve their services and survive. Competitive pressure combined with the appropriate regulatory measures can lead to efficiency. If taxis are unable to respond to the challenge of Uber, then they will gradually be driven out of the market and Uber will become the dominant player. For example, liberalising price regulations could make taxis more competitive, by increasing social benefits further (as the Irish example has shown). The fixed rate of taxi fares was introduced to remove information asymmetries and protect consumers from taxi drivers behaving improperly. If new technologies can prevent such risks, then restrictive price regulation will no longer be necessary. If taxis are unable to respond to the challenge of Uber, then they will gradually be driven out of the market and Uber will become the dominant player. In this case, potential entrants and smaller competitors would fear abuse of dominance by Uber. A proper regulatory response should address such concerns. In 2014 members of Uber’s New York office were accused of using aggressive sales techniques against their sharing economy competitors Lyft and Gett. 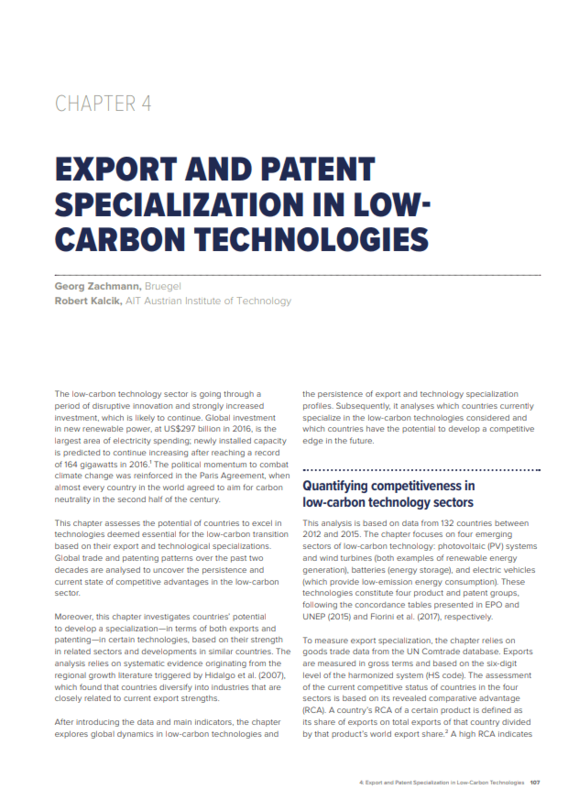 This shows that technology can also be used to develop market strategies that damage competition and set entry barriers, without strictly violating competition law. Given Uber’s dynamic pricing policy, passengers can also be hurt when prices are high if there is a lack of alternative operators. If traditional taxis were taken out of the market and other sharing economy firms were unable to enter, there would be limited alternative options besides Uber, especially in cities with poor public transportation. The future of urban transportation will rely heavily on technologies that facilitate information sharing and reduce asymmetries. Authorities should make sure that the market remains open to competitors of Uber, so that passengers are able to switch operators and Uber does not become dominant in the market, as market dominance and monopolies are translated to high prices for passengers. The future of urban transportation will rely heavily on technologies that facilitate information sharing and reduce asymmetries. It is up to regulatory bodies to certify that the associated efficiency gains will be maximized and distributed in a fair share among all involved parties. The taxi industry should be more lightly regulated. Current taxi industry regulations aim to protect taxi drivers from competition. The emergence of platforms like Uber makes the market more competitive and benefits consumers through lower prices and better quality services. Liberalisation of the industry may help taxi drivers to compete more effectively with Uber, by improving their services. At the same time, switching costs should be low so that Uber drivers are able to work for multiple companies. The current employment status of Uber drivers shifts the most of risks towards them. Uber must adopt a new employment relationship towards its workers, preserving flexibility over working hours, but also ensuring a safe work environment. Work protection and insurance would make roles, responsibilities and liabilities distinct and transparent. Increased work protection would also incentivize Uber to run additional background checks and to increase the standards of its operation, for example through well-defined insurance schemes). Passengers and drivers would no longer be under legal uncertainty about liabilities, reducing potential legal costs. Collective bargaining should play a greater role. Under its current business model, Uber has all the bargaining power. It fixes the price of the offline service, sets the conditions under which passengers and drivers use the online platform, and markets and negotiates the purchase of the service. Letting Uber drivers name their fares and compete for passengers could create extra flexibility and benefit consumers. Regulation must also take into account data privacy issues. Since personal data is involved, data protection authorities must make sure data is safe, in line with the criteria and safeguards that have been established by the Directive 95/46/EC of the European Parliament and the European Council. Data portability should be secured so that users of the Uber platform can move to a competitor platform whenever they want. International cooperation and harmonization of tax rules is needed to eliminate tax evading strategies. Taxing online platforms has proven problematic. Online platforms, through their subsidiaries, can be taxed in Bermuda for a ride that took place in Italy. The call for a global tax rule by Piketty (2013) will not only reduce inequality, but could also improve the public finances of many countries. Since traditional local industries cannot use online networks to avoid revenue taxes, such practices can jeopardize a level playing field. Technology can enable us to move to more efficient ways of transportation which can benefit passengers and society. The sharing economy must be carefully regulated so that we can fully maximize efficiency gains. We must set the rules of interaction between online ridesharing and traditional firms in order to secure a level playing field. At the same time, we should make sure that a safe work environment is provided, eliminating potential risks for passengers and drivers. 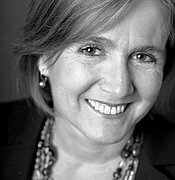 Excellent research assistance by Elena Vaccarino is gratefully acknowledged. 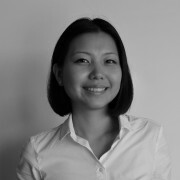 See Gata (2015), “The Sharing Economy, Competition and Regulation”. 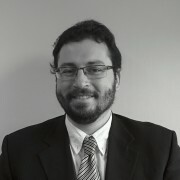 Competition Policy International. See Uber’s October 2015 mobility case study for Paris. See Table 6 in Hall and Krueger (2015), “An Analysis of the Labor Market for Uber’s Driver-Partners in the United States”. Working Papers (Princeton University. Industrial Relations Section). 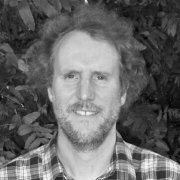 See Geradin (2015), “Should Uber be Allowed to Compete in Europe? And if so How?”. Competition Policy International. Thomas Piketty (2013), “Capital in the Twentieth Century”. Harvard University Press. Machine learning and artificial intelligence (AI) systems are rapidly being adopted across the economy and society. Early excitement about the benefits of these systems has begun to be tempered by concerns about the risks that they introduce. How can competition policy adapt to market changes caused by new technologies, digital platforms and big data companies? Crypto assets: is a regulatory framework needed? Despite the efficiencies and benefits associated with the collaborative economy, there are concerns about how it can be properly regulated. The difference in regulatory regimes for online and offline services can lead in some cases to situations of unfair market competition. Fintech has the potential to change financial intermediation structures substantially. It could disrupt existing financial intermediation with new business models empowered by intelligent algorithms, big data, cloud computing and artificial intelligence. Fintech has the potential to change financial intermediation structures substantially. It could disrupt existing financial intermediation with new business models empowered by intelligent algorithms, big data, cloud computing and artificial intelligence. Policymakers need to consider four questions urgently: Develop a European or national fintech market? 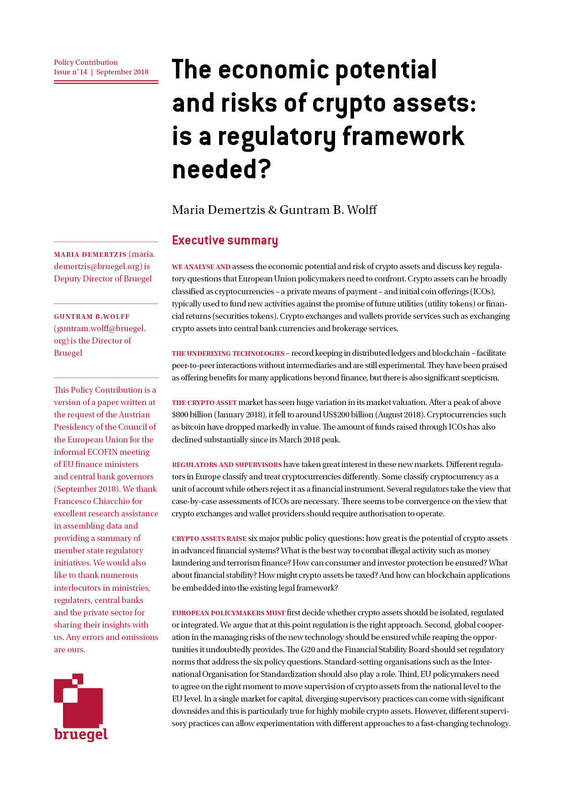 What regulatory framework to pursue? 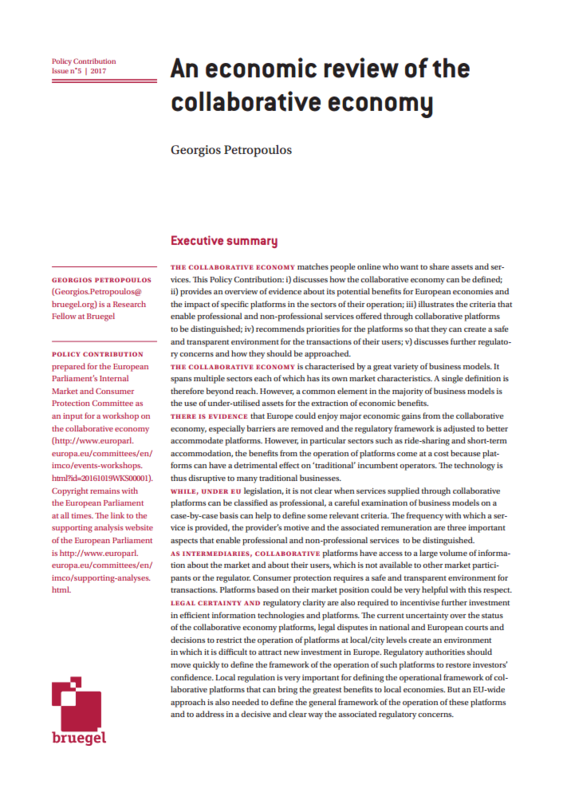 Should supervision of fintech be exercised at the European level? What is the overall vision for the EU’s financial system? While the activities using the peer-to-peer cryptocurrency Bitcoin swing between legal and illegal, the attention has been increasingly shifting to the technology underlying Bitcoin, known as blockchain. 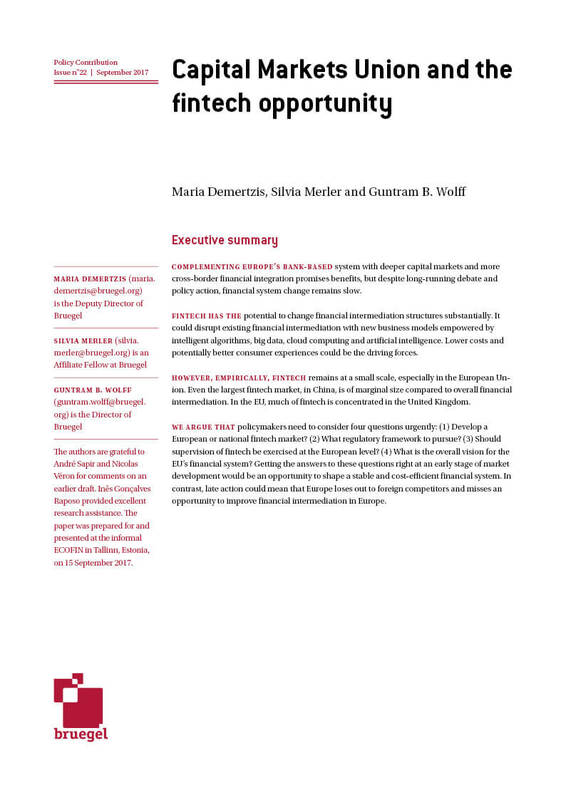 The mechanics and economics of Bitcoin have been reviewed in a previous Bruegel blogpost. In this blog review we explain, or at least attempt to, what blockchain is and whether it contains the extraordinary innovation potential that its proponents believe it to have, or perhaps such hype is oversold. This Policy Contribution tackles the definition and benefits of collaborative economy, as well as the distinction between professional and non-professional services, recommendations on safety and transparency for users, and the way to approach regulatory concerns.